Jelly King is aimed particularly at cooks who want to make crab apple jelly - the orange/pink fruits produce a jelly of the same colour. However Jelly King is more than just a crab apple jelly specialist, it is actually a great all-round crab apple. The white flowers are borne in profusion and provide an intense and long-lasting display in spring whilst in autumn the large fruits are particularly attractive too, and persist well into December (although unlike other persistent crab apples birds tend not to go for them). Once the tree is a few years old it becomes a heavy-cropper so even if you pick some for the kitchen there will still be plenty to provide autumn colour on the tree. Malus Jelly King® is a protected variety. 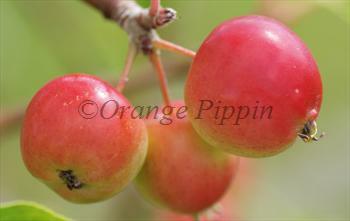 Please fill in the details below and we will let you know when Malus Jelly King crab apple trees are back in stock. 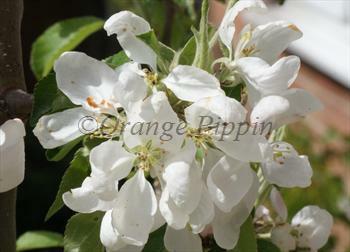 Malus Jelly King is in flowering group 3. Malus Jelly King is self-fertile and does not need a pollination partner, although fruiting may be improved if there is a compatible tree of a different variety nearby. Jelly King is a relatively vigorous grower but with compact upright proportions. Developed in New Zealand in the 1970s, sometimes known as Mattfru.